Gear fails: Nicki’s sunglasses broke (more down to her bad packing than anything else); won’t know if the steripen is working until we don’t get sick. Wrong turns: One – not disastrous! Nice French man and his dog pointed us on our way. Menu: 1/3 baguette and jam, 1/3 baguette and peanut butter, soft drink, 4 squares of dark chocolate, 1/3 baguette and chorizo (SOOOO GOOD!). Note: We did have a tomato planned but it rolled out of Nicki’s bag and was unsalvagable. Bad packing again. The day has finally come!! We rose at 6am and it wasn’t long before we got our stuff together and were on the road. Goodbye sea! See you in a few weeks! Our plan for the day was to hit 40km. It was a confidence thing really – we wanted to be able to get some k’s under our belts fast just to prove we could. The first few kilometres wound around the bay and we were soon climbing through the pretty streets out of town. We were running, as planned, and the sun wasn’t yet high enough to make us sweat. 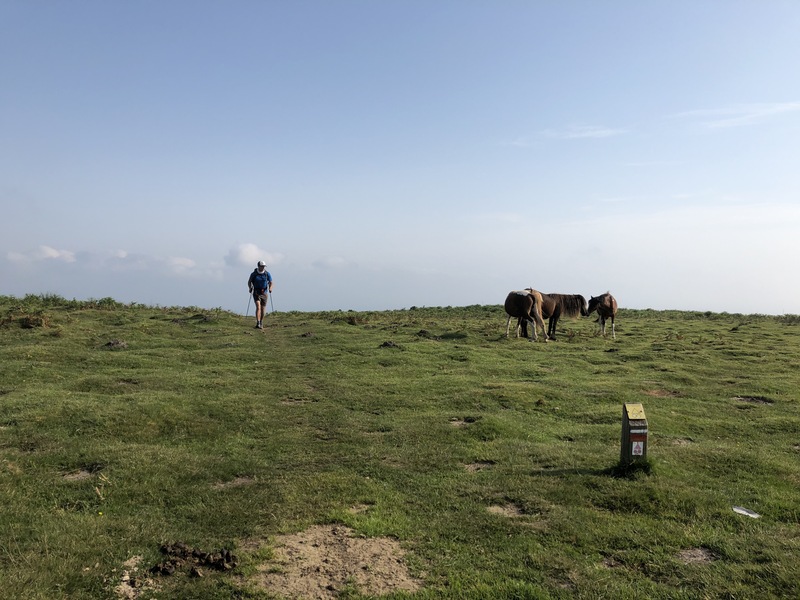 We made the wise (but hard) decision not to turn into Biriatou for a coffee, and started our first ascernt up to Col d’Osin rewarded with awesome views of the bay and Hendaye. This is when the tomato disaster happened. Quickly followed by the broken sunglasses. It all happened so fast! Luckily, after the end of our second big climb, we found a restaurant with 1 euro cafe au lait. Turns out we were actucally in Spain, on the border town of Mandale, where people don’t seem to know which langue to speak. French? SPANISH? Basque? Of all the villages we’ve passed through today, this was the strangest. We dropped onto the street straight from the trail to find a bustle of supermarkets and big brand stores. 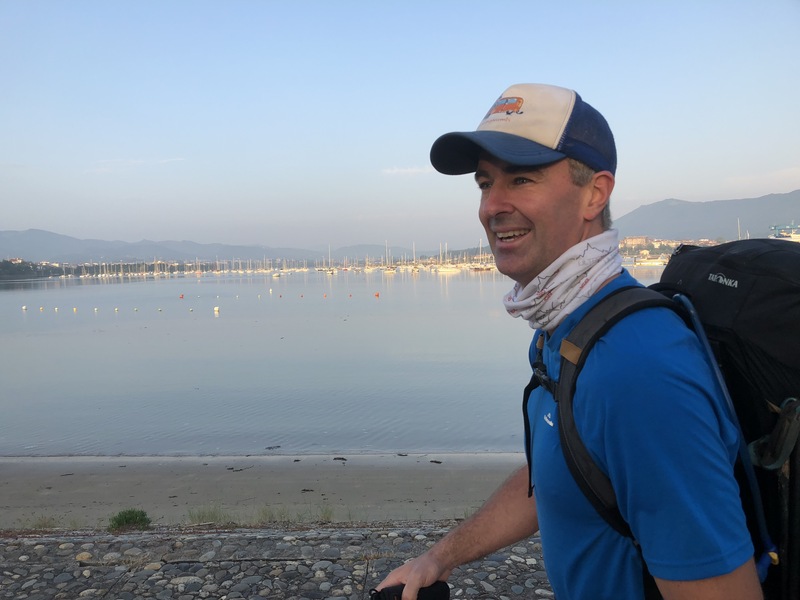 While we’re on the topic, there’s something you should know about the GR10 – it’s designed so that it can be completed a series of short multi-day walks, as well as a thru-hike. So the trail takes you over mountains and drops into villages almost everyday. Great for those who want to travel light (they say you only need a credit card). Not great if you don’t like hills. For us, it means we can grab some provisions every couple of days and hit the free wifi at tourist information offices. Thankfully, we happen to love hills. 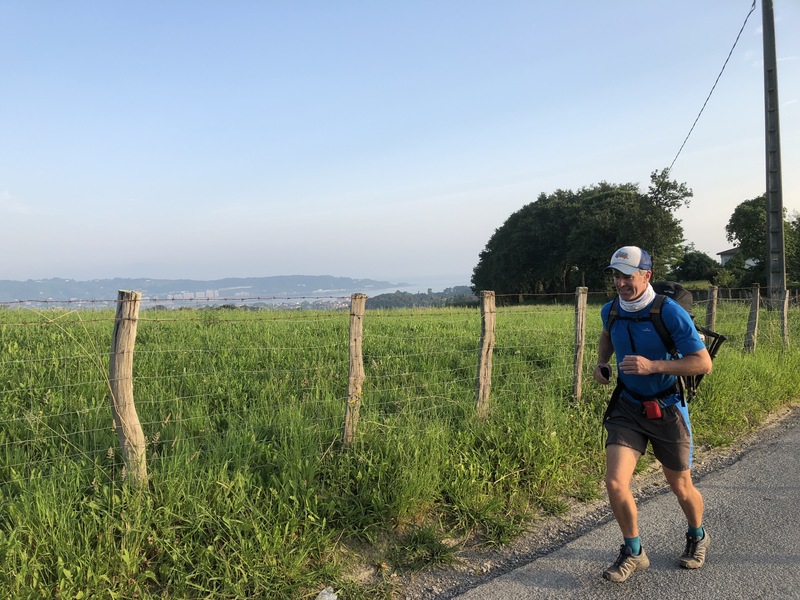 A few kilometres after the border town and we started getting some of my favourite types of trail – winding through forests alongside a river, over hills and eventually into a clearing with chestnut trees and horses. But we were feeling too good too soon. We walked through a busy little carpark – strange, we thought. Then we saw runners and hikers on our trail. 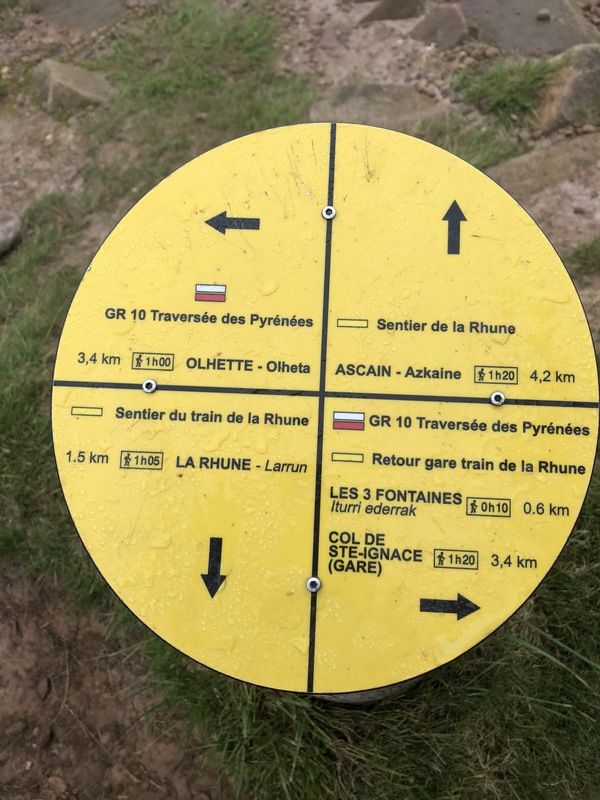 Turns out our next section – Col does Trois Fontaines is a hugely popular fitness track. 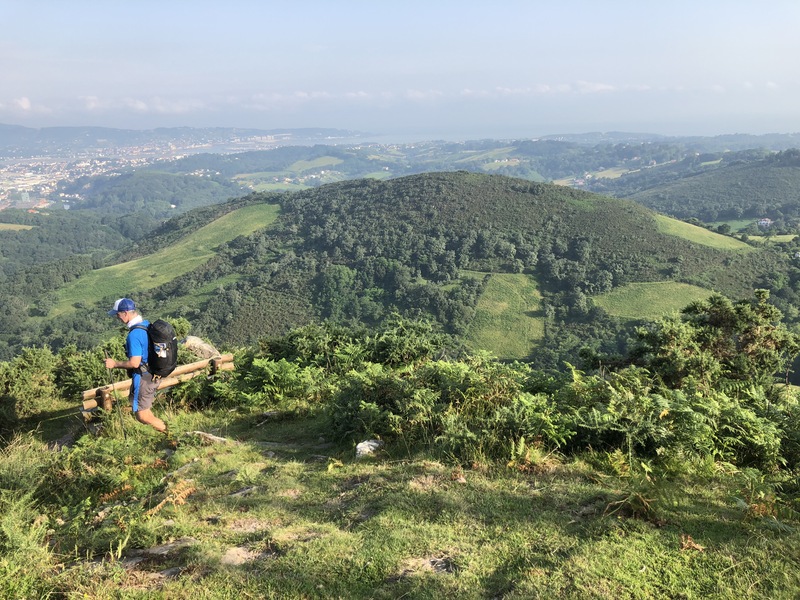 No prizes for guessing why…the hill climbs ridiculously steeply for 3.5km before reaching a plateau of criss-crossing trails. We pout our heads down, gradually the mist descending around us. No views. But the feeling up at the summit was still pretty special. It was now 2pm and our heart was set on a cold one in Sare (I’d read this was a pretty town with cafes and a supermarket). The book didn’t lie. Problem is, everything shuts between lunch and about 4pm. We were lucky enough to find a tiny cafe serving cold drinks, so hung out savouring Coca Cola from glass bottles while waiting for the Spar to open so we could grab brekkie for tomorrow. 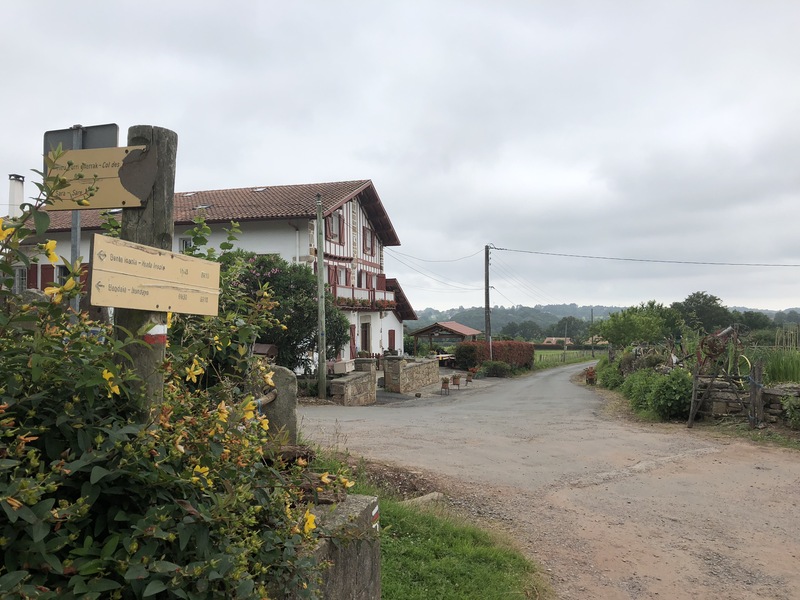 Here’s the weird thing- we were so desperate for a break but when we got it, we didn’t collapse and rest our weary legs (and backs) – we wandered around the town checking out the basque tarts through darkened patisserie windows. Spar opens. No baguettes! We settle on some crappy square bread things and look for the little red-white stripes to show us the way out os Spar to our final 10km. Two kilometres from Ainhoa, we discovered a little patch of grass near the river and decided to set up camp. 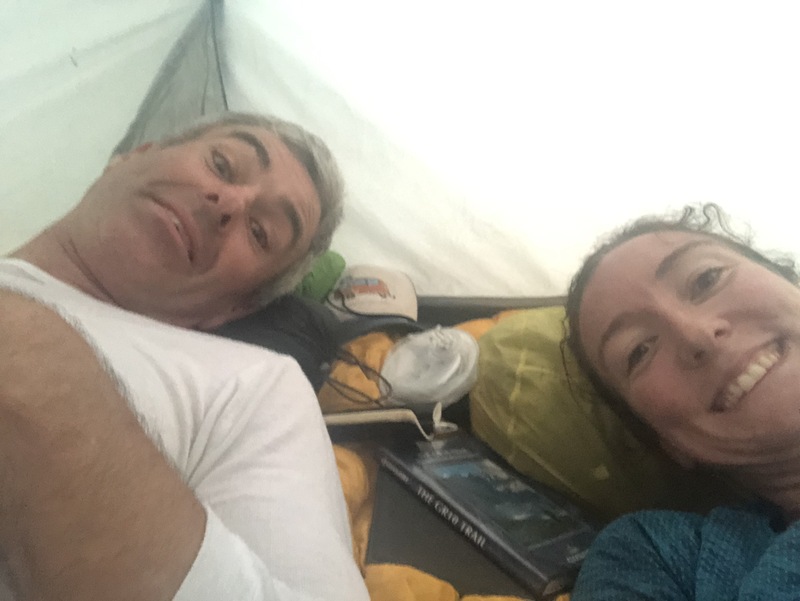 An icy bath washed away the day and we’re settling in for a night on our blow-up mats in the world’s tiniest tent. There’s nowhere else I’d rather be. Well done both. Good to hear you made it to Europe. If your running anywhere near Hereford call in for a cold one!